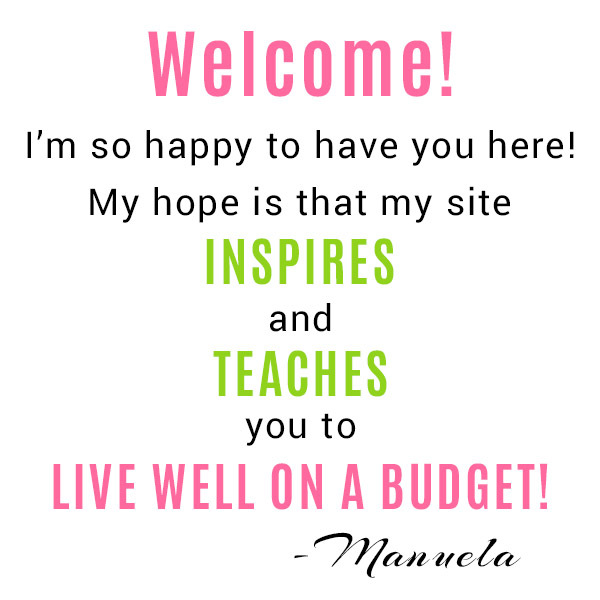 Can you believe it’s almost time for a new year? It’s seems like this year was just starting! But it’s nearly time to ring in the next year, which means you’ll need some yummy treats to help you celebrate! To keep your New Year’s Eve fun and stress free, these semi-homemade cookies use commercial cookies as a base. 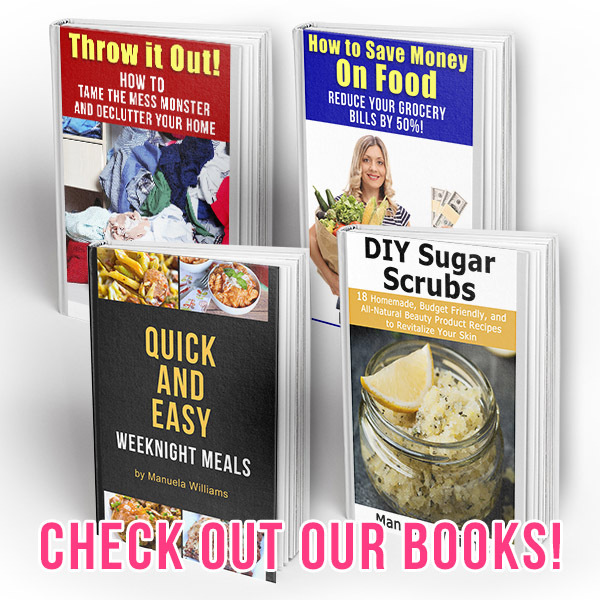 But I’m going to show you how to change them up into something fun, festive, and delicious! 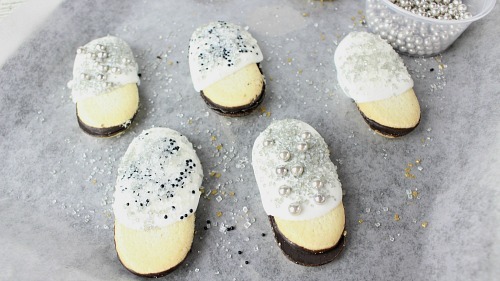 Here’s how I made these pretty New Year’s Eve Milano Cookies! 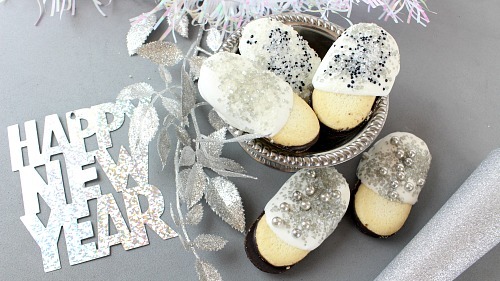 These New Year’s Eve Milano cookies would be a fun food craft for kids to make on New Years Eve! Or a quick and easy festive dessert for a New Year’s Eve party. 1. 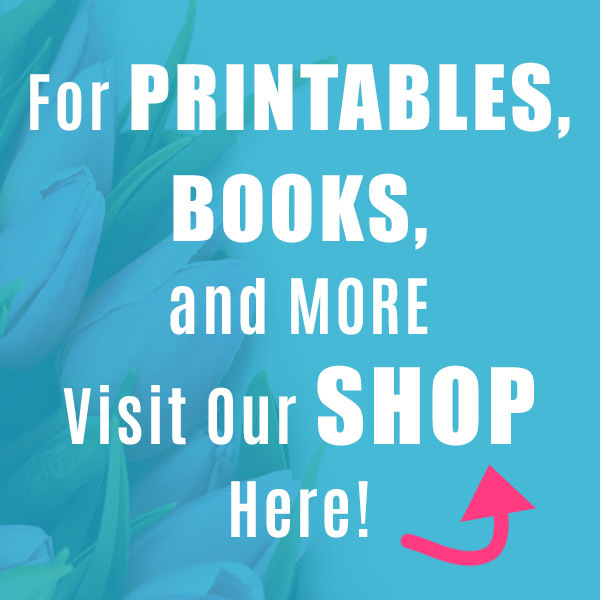 Line a large cookie sheet with wax paper or parchment paper and set aside. 2. In a small microwavable bowl, microwave the dark cocoa candy melts for 45 minutes. Stir until completely melted and smooth. 3. Dip 6 of the cookies into the melted chocolate, covering about 2/3 of each cookie. Place on the lined cookie sheet. 4. 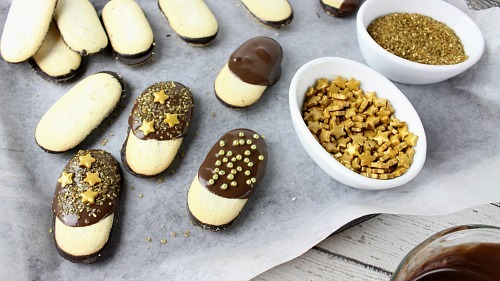 Immediately sprinkle with gold sugar crystals, gold ball sprinkles, and/or gold star sprinkles. 5. In a small microwavable bowl, microwave the bright white candy melts for 45 minutes. Stir until completely melted and smooth. 6. Dip the remaining 6 cookies into the melted white chocolate, covering 2/3 of each cookie. Return to the lined cookie sheet. 7. 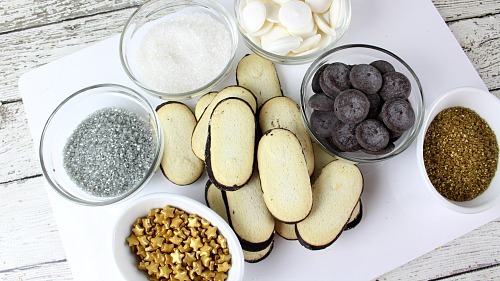 Immediately sprinkle with the white, silver, and/or black sugar crystals and silver ball sprinkles. 8. Set aside for 30 minutes to allow the chocolate to completely harden. Then enjoy your New Year’s Eve Milano cookies! What treats do you usually have on New Year’s Eve? 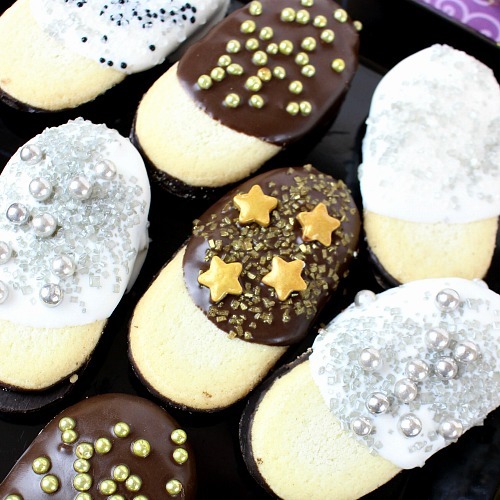 It’s so easy to make these festive (and delicious) semi-homemade New Year’s Eve Milano cookies! 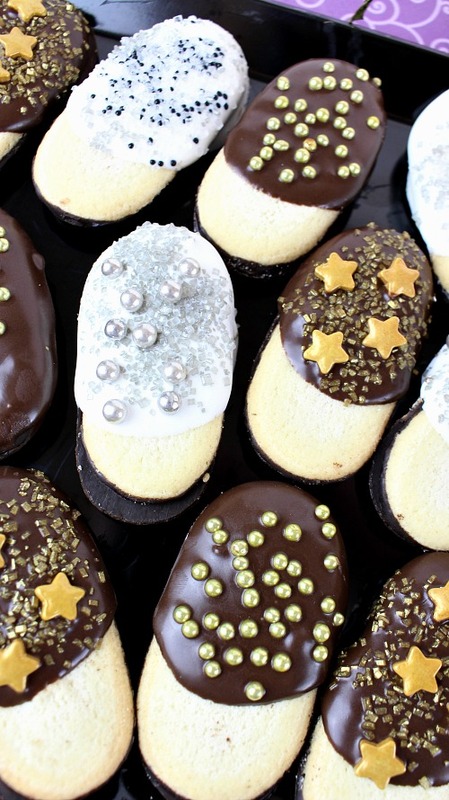 They’re easy enough for kids to make, and make wonderful New Year’s Eve party treats! 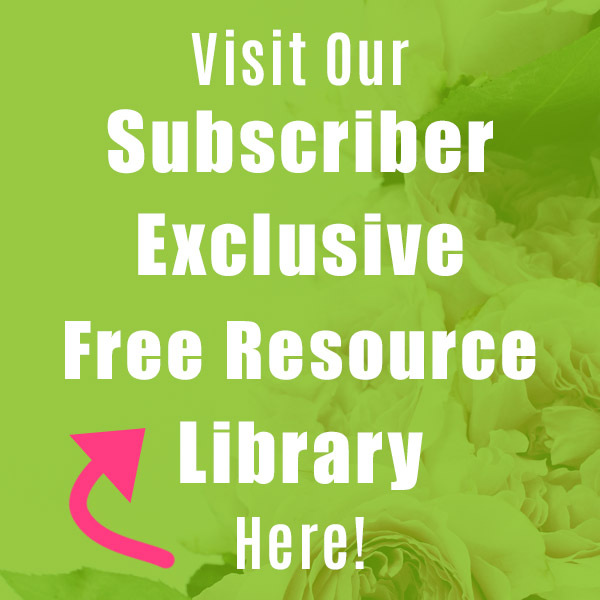 Line a large cookie sheet with wax paper or parchment paper and set aside. 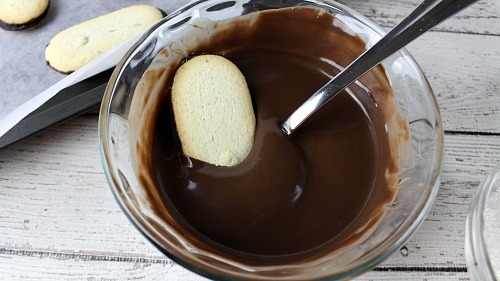 In a small microwavable bowl, microwave the dark cocoa candy melts for 45 minutes. Stir until completely melted and smooth. Dip 6 of the cookies into the melted chocolate, covering about 2/3 of each cookie. Place on the lined cookie sheet. 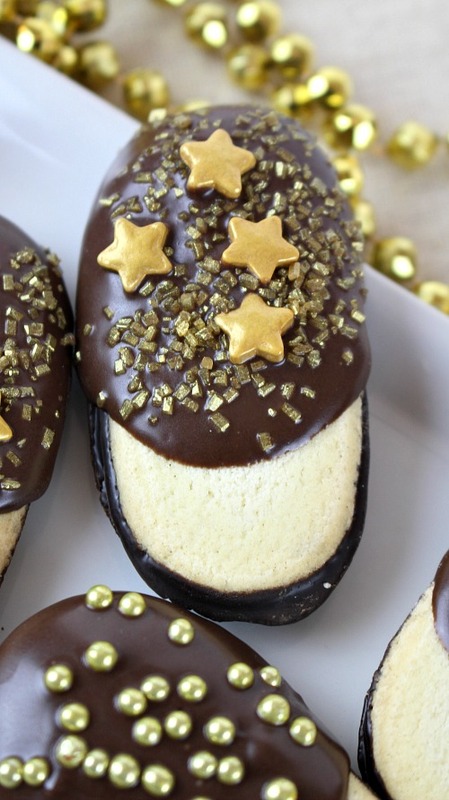 Immediately sprinkle with gold sugar crystals, gold ball sprinkles, and/or gold star sprinkles. In a small microwavable bowl, microwave the bright white candy melts for 45 minutes. Stir until completely melted and smooth. Dip the remaining 6 cookies into the melted white chocolate, covering 2/3 of each cookie. Return to the lined cookie sheet. 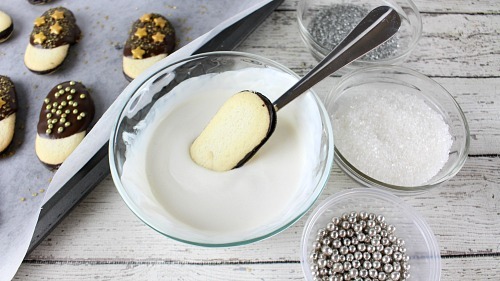 Immediately sprinkle with the white, silver, and/or black sugar crystals and silver ball sprinkles. Set aside for 30 minutes to allow the chocolate to completely harden. Then enjoy your New Year’s Eve Milano cookies!